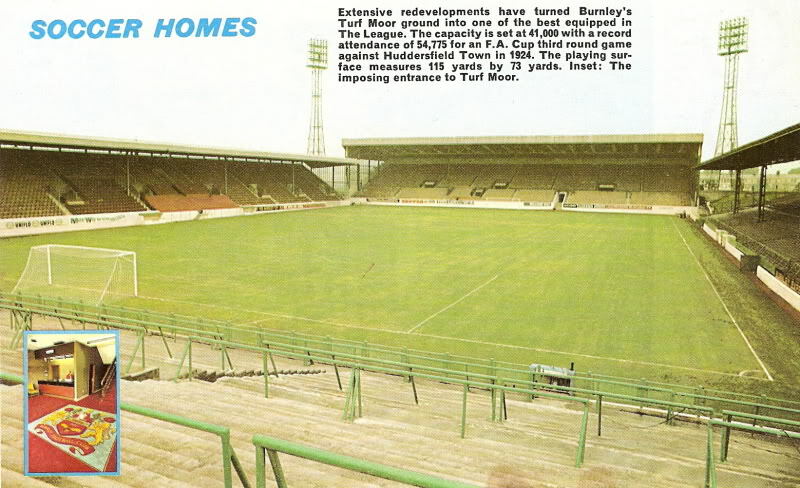 The picture of the football ground below from a Football Review magazine shows the famous Longside stand which survived redevelopment until it was replaced by the James Hargreaves Stand in 1995. "Extensive redevelopments have turned Burnleys Turf Moor into one of the best equipped in the League. The capacity is set at 41,000 with a record attendance of 54,775 for an FA Cup third round game against Huddersfield Town in 1924. The playing surface measures 115 yards by 73 yards. Inset : The imposing entrance to Turf Moor." I have also found an absolutely stunning piece of old film footage on Google that shows the old Turf Moor ground as it used to be in the 1970s.